The free Tether app is available for both Android and iOS devices, making it easy to set up the Archer C1200 and manage your network settings. Three external antennas with advanced connection technology allow you to maintain impressive speeds, even over greater distances. 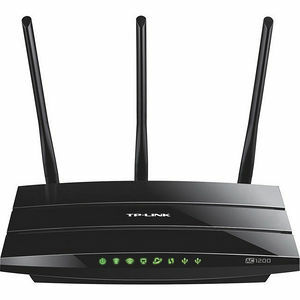 This means that you can enjoy incredible wireless coverage and reliability in any part of your large home or office. With the two USB 2.0 ports, you can share printers, files, and media with numerous devices on your local network or via FTP server from anywhere in the world. With four built-in gigabit Ethernet ports, the Archer C1200 can provide fast, stable connections to all of your favorite wired devices, including game consoles, smart TVs, DVRs, and more.